From earlier this week, NASA's Earth Observatory posted one of the most awesome videos I've ever seen. Honestly, I think it's right up there with that first Earthrise photo during the Apollo program. 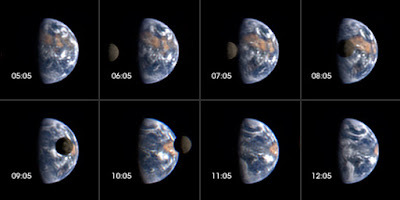 In the entry on their website, the following image shows the transit of the Moon across the surface of the Earth. The video, on the other hand, is worth saving. You'll want to tell all your friends about this one.